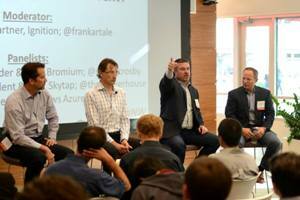 So says Simon Crosby, co-founder and CTO of Bromium, a cloud security company, and a panelist at this week’s Washington Technology Industry Association TechNW: North to Innovation event on cloud computing and big data. Crosby, who previously co-founded XenSource, maker of the Xen open-source hypervisor used by services including the Amazon Elastic Compute Cloud, says public clouds are ready for enterprise IT use. But the people working in enterprise IT organizations came up in the world racking and stacking on-premises servers, and installing and managing Windows—“skills we don’t need anymore,” he says. You sell to people’s existing fear set, he says, so regardless of how cool your technology is, if the person making the purchasing decision doesn’t feel empowered by it, it’s not going anywhere. “It will all be better once we’ve retired,” he says. Indeed, he sees a radical transformation of business from top to bottom resulting from the economies of scale offered in public clouds. It’s no secret that this represents a major area of opportunity for the Northwest, with the three leaders in cloud computing—companies big enough to deliver computation, storage, and networking as a service—based here (Amazon and Microsoft) or with a significant presence here (Google). Bob Kelly, corporate vice president of Windows Azure marketing (third from left in the photo above), says the shift to cloud computing is inevitable. As with prior shifts from mainframes to the client-server model, and from there to the Web, “economics always win,” he says. Cloud computing flips the cost model for computing from capital expenditure to operating expenditure that scales up or down with the growth of the business, which makes it attractive to enterprises. Crosby (above, second from left) says the biggest opportunity in this shift “is not so much for the incumbents, but for the innovators.” He points to Netflix, Uber, and Airbnb as examples of “massive infrastructure companies that couldn’t exist” without cheap cloud computing. “Building a startup today doesn’t require buying a boatload of servers,” he says. Thor Culverhouse, CEO of Seattle-based Skytap (above, left), which enables software development and compute-heavy testing in the cloud, says this technology shift also places more emphasis on the quality of a new business idea. “If you’re an entrepreneur with a great idea, the barrier to entry is not how well you build out your infrastructure, but how good is the idea,” he says. While startups beginning from scratch have led the way in cloud computing adoption, established enterprises in several industries are getting ready to adopt cloud computing in greater numbers, Culverhouse says. Financial services—a sector with one of the largest IT budgets—is already there, driven in part by the scarcity of space in financial centers such as New York to add more on-premises servers, Crosby says. That should be a strong enough endorsement of the security of a public cloud, compared with on-premise datacenters and private clouds, he says. “In general, from a security perspective, the cloud is where you want your data to be,” he says. Kelly says in the last two years, enterprises have gone from fear of the public cloud to recognition that it allows them to do things they couldn’t have done before. Companies like actuarial giant Milliman are able to rent 10,000 servers to run a Monte Carlo simulation overnight, and then “turn off the lights” when they’re done with the task, as opposed to an old model of spending many thousands or millions to have that kind of hardware on premises. “That’s transformative,” Kelly says. Kelly distinguishes Microsoft’s approach to cloud computing from Amazon’s, saying AWS has come at it principally through the lens of the startup ecosystem, providing resources that are close to free, and tightly coupled with the venture capital community. Microsoft, he says, has begun from its strength in the enterprise IT market, and takes the position that its enterprise customers will always have a hybrid IT environment including some functions in the public cloud, some in private clouds, and some on their own premises. Crosby observes that the skills required to develop applications to run on the AWS and Windows Azure platforms are significantly different. On Azure, developers can use existing skills honed building software for the Microsoft ecosystem, he says. Amazon as it is now uses an entirely different syntax and semantics, he says, and AWS developers can do just fine knowing nothing at all about .NET, Microsoft’s 11-year-old software development framework. “What’s really important to me is to pick the right platform given where you’re going,” he says. Kelly says key areas ripe for innovation today include network performance, which becomes more critical as cloud adoption increases; “cross-cloud management”—just like it sounds, the challenge of managing computing that extends across multiple public and private cloud environments; and controlling encryption keys for software as a service (Saas).